UCSD map information via the new UCSD iPhone application. The University of California, San Diego this week became the first public university in the nation to offer an iPhone application that provides mobile access to the latest information about its courses, faculty, athletics and even videos from the university’s YouTube channel. The free application will be most helpful to students, who will be able to touch the screen of an iPhone or iPod Touch to access a wide variety of information about UC San Diego, including current and next-quarter course listings, an interactive campus map that pinpoints the location of each course’s classroom, and the ability to telephone, email or send a text message to instructors teaching any course of interest. Information about this application and download instructions can be found at http://iphone.ucsd.edu. By the end of 2009, a Blackberry equipped with multi-touch capabilities will operate the same application. 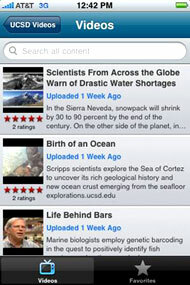 UCSD video information via the new UCSD iPhone application. The new application was developed for UC San Diego in only two months by TerriblyClever Design, a Palo Alto, Calif.-based startup company formed by two Stanford University undergraduate students. Harel said the TerriblyClever team was able to make a variety of improvements to an iPhone application that had been developed previously for Stanford and Duke University. The UC San Diego campus is one of the most networked locations in the world, with more than 2,500 Wi-Fi access points that blanket the campus with high-speed wireless Internet connectivity. The lower-cost iPod Touch can use the same application within range of any Wi-Fi access point. In areas off campus or otherwise without Wi-Fi connectivity, iPhone users will be able to use their cell phones’ signals to access the same information. UCSD sports information via the new UCSD iPhone application. The iPhone application provides UC San Diego sports news, schedules, and scores for everything from basketball and crew to volleyball and water polo. Current and prospective students and their parents can use the application to browse and search for current and future course schedules, including course descriptions, section times and locations, instructors’ contact information and other pieces of information from the official Schedule of Classes found at UC San Diego’s TritonLink website. Users of the application will also have access to videos available on UC San Diego’s YouTube channel. 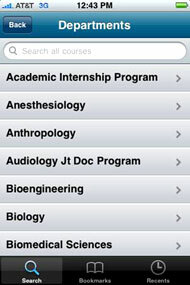 UCSD course information via the new UCSD iPhone application. The application includes a searchable campus directory of faculty, staff and students. A tap on a touch-screen will provide options to make an immediate phone call, text message or email. Application users can even use the feature to quickly update their iPhone contacts list. 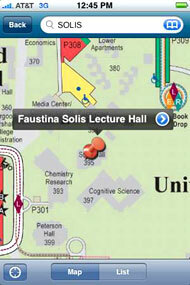 An interactive map feature offers a convenient way to search the campus for buildings by their name, pinpoint them on the map, view building photos, and see the position of those buildings relative to the current position of the person holding the iPhone or iPod Touch using GPS services.